The role of writing in promoting well being is an emerging field in personal and professional development. Use writing exercises as an avenue to promote reflection, self-expression and insight into our professional identities as artists. Toronto, September 15, 2017 – Applications are now available for all three funding programs under the Indigenous Culture Fund (ICF). The ICF programs for individuals and organizations have been established to support First Nations, Inuit and Métis communities, culture and way of life. Names of members voting on the motion below will be recorded but not circulated. A majority from the returned survey votes is needed to approve or reject a motion. The chair (president) shall not exercise a vote except to break a tie. Nous noterons les noms des membres qui se prononceront sur la proposition ci-après mais ne les divulguerons pas. La proposition sera adoptée ou rejetée selon la majorité des votes reçus en réponse à ce sondage. 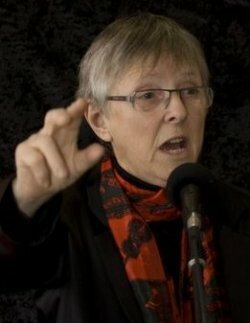 La présidente ne peut voter, sauf en cas d'égalité des voix. Merci à tous! Thank you! SC-CC is pleased to announce the successful grant proposals for Canadian Storytelling Night (CSN) event funding assistance! 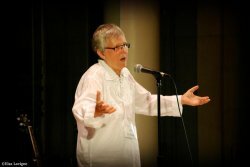 The Nelson Storytelling Guild, TALES Calgary, the Saskatoon Storytelling Guild, Storytelling Orillia, and Toronto'sYork Storytelling Guild will be receive assistance for their CSN events. We can't wait for CSN on November 4th! Yesterday afternoon in Ottawa, the many friends and family of master storyteller and SC-CC founding member, Jan Andrews gathered to celebrate her life and work. Tune in this week - September 12th, 13th and 15th to our Facebook Live sessions about the new Digital Strategy Fund. 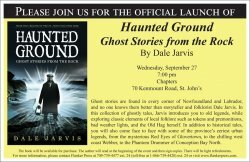 Please join us for the official launch of Haunted Ground: Ghost Stories from the Rock by Dale Jarvis on Wednesday, September 27, at 7:00 pm at Chapters (70 Kenmount Road, St. John’s). It is with great sadness I share news of the sudden passing of Jan Andrews on Saturday, September 2nd, 2017. 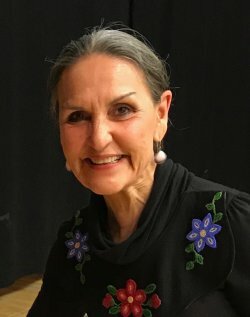 She was a master storyteller, accomplished author, one of the founding members of Storytellers of Canada-Conteurs du Canada and recipient of the 2016 Order of Canada medal for all her contributions to the Arts.